The CREATIVE Decontamination System Performance Model. Courtesy of Michael Roberts, JSTO. Experts from the Defense Threat Reduction Agency’s Joint Science and Technology Office and the Edgewood Chemical and Biological Center are getting creative with a new decontamination System Performance Model (SPM). Led by JSTO’s Mr. Michael Roberts and ECBC’s Dr. Brent Mantooth, the Contact hazard, Residual hazard, Efficacy, Agent, Test and evaluation, Integrated and Variable Environment (CREATIVE) decontamination SPM uses a computer-based modeling approach to simulate processes. These include contamination, decontamination and post-decontamination contact when a chemical or biological agent is present. Decontamination involves a complex series of interacting processes that contribute to post-decontamination hazards such as vapor emission and contact transfer. 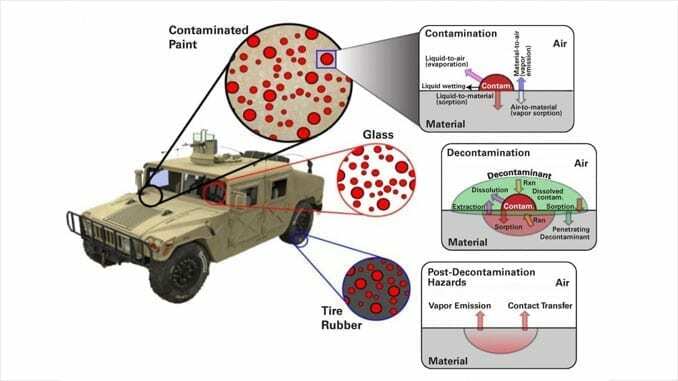 Currently, the CREATIVE SPM uses deterministic physics-based models to simulate contamination, decontamination and post-decontamination hazards for a wide range of military materials from traditional and emerging threats. Each contaminant-material-decontaminant combination is a unique system with substantially different responses. The model parameters are not trivial to determine and most parameters vary with environmental conditions such as temperature, humidity and wind. The CREATIVE SPM allows the DoD to employ new technologies by understanding the driving mechanisms behind decontamination and simulating the conditions that are not safe, not capable or cost-prohibitive to test. The JSTO and ECBC team will continue to increase computational capability and efficiency when characterizing and implementing decontamination kinetics within CREATIVE SPM. Developments will continue throughout fiscal year 2017 as the team enhances models for complex military materials to improve the predictive capability for vapor and contact exposures. Source: DTRA Chemical and Biological Technologies Department, adapted.